Although John Ramage (circa 1748-1802) is well-known among art historians and collectors of portrait miniatures, his name is not immediately associated with Washington portraiture. Yet, Ramage painted George Washington from the life and was the first artist to whom he sat as President of the United States. Little is known of John Ramage’s early life. He was born in Ireland and is known to have entered the Dublin Society Schools in 1763. 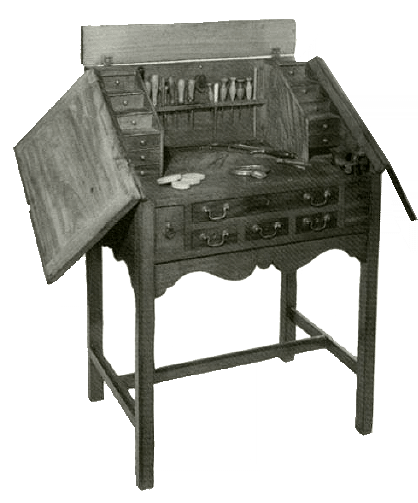 From there he ventured to London to pursue his career and later crossed the Atlantic to Halifax, Nova Scotia, all the while improving his skills as an artist and expert goldsmith. Ramage was in Boston, Massachussetts when the Revolutionary War broke out. There he enlisted in a unit formed by Irish Loyalists to fight the American colonials and General Washington’s Continental Army. Ramage was in Halifax with his regiment in 1777 when he decided to withdraw and head for British-occupied New York. There he remained after the British evacuated the city and became firmly establish in New York’s small artistic community. Considered the best artist in the city, he was the obvious choice for Martha Washington’s commission, and to a long list of distinguished New York citizens, Ramage now added the President of the United States. The sitting took place on October 3, 1789, probably in the president's official residence on Cherry Street in New York. There could not have been two more disparate characters who faced one another that Saturday morning. The president was reserved, dignified, and discreet, not given to idle conversation. Here was the victorious American general against whose forces the colorful Irish artists and Loyalist had fought. At six feet two and a half inches, George Washington stood well above the much shorter artist. John Ramage had lived the high life; was thrice married, the second, a brief bigamous liaison. Characteristically, he dressed to be noticed. His striking and costly attire is said to have included a scarlet coat, embroidered waistcoat, and black satin breeches set off with paste knee buckles. A small cocked hat, gold-headed cane, and gold snuff box added to an appearance of flamboyant luxury which Ramage could ill afford. He was frequently debt-ridden and eventually fled to Canada to avoid permanent incarceration towards the end of his life. Although no match for the resplendent artist, the president was himself rather splendidly attired in uniform, hair powdered and curled above his ear in a long roll. Was the uniform Mrs. Washington's choice, as it may well have been on other portrait occasions? From John Ramage's single sitting with Washington, he developed two distinct images of the nation's first president. The portrait miniatures are painted on ivory supports distinctively shaped in an elliptical pattern. He modeled his subjects' faces with delicately shaded cross-hatching overlaid with linear strokes so fine and smooth they have sometimes been compared to the rich luster of enamels. Ramage's gold casework is equally beautiful. The Washington miniature is set off in his familiar style. An outer gadroon border adds weight to the delicately chased scallops, festoons, and stippled patterns. 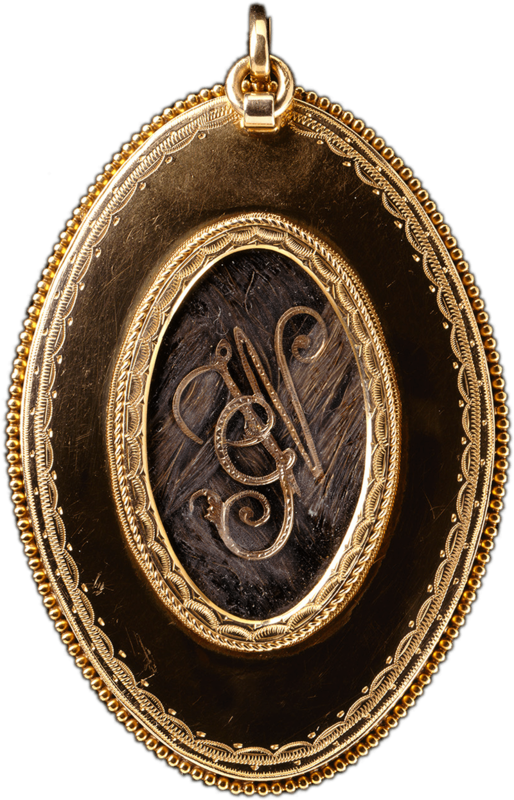 Nor does the back lack interest, it frames a lock of Washington s hair enhanced with a finely cut "GW" cypher. Martha Washington must have been enchanted with Ramage's work. Portrait miniatures are among the most intimate keepsakes and often marked milestones in Martha Washington's life. During the Revolution, Martha is known to have carried a miniature of General Washington, who also kept one of her close at hand. These were the work of Charles Willson Peale. It was natural, then, for Martha to want a similar memento of her husband during the presidency. Of immediate relevance in October 1789, was the president’s impending departure from New York. While Congress was in recess, Washington planned a month-long tour of New England. He left home on October 15 and returned on November 13. Mrs. Washington remained at home with her grandchildren, Eleanor and George Washington Custis. 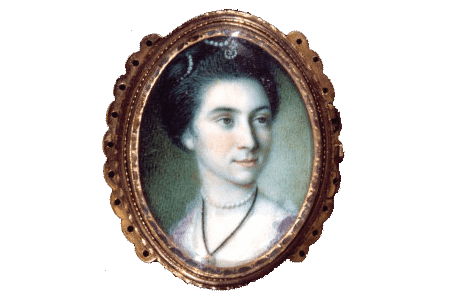 Her daughter, Martha Parke Custis, died in 1773, not long after Charles Willson Peale painted companion miniatures of the teenage girl and her brother, John Parke Custis. George Washington’s death in 1781 left the mourning mother doubly bereft; she later had Peale reset these miniatures as a pair of bracelets.